Most data centers are hidden away inside faceless warehouses and sport massive rows of computers and giant air conditioning units to keep things cool. But apparently that’s not good enough for Microsoft, so for its newest data center, the company crammed 12 racks of servers into a bus-sized metal cylinder, and then sank it off the coast of northern Scotland. As ridiculous as that might sound, the idea behind Microsoft’s underwater server farm came from a pretty sensible question: Almost 50 percent of the world’s population lives near the coast, so why aren’t data centers located near the water too? So to explore that concept even further, Microsoft created Project Natick. And in the time since the team was first put together in 2014, Microsoft has learned a lot about underwater data centers that makes the idea worthwhile. By putting a server farm in the ocean, the self-contained data center can use the surrounding water to help regulate the unit’s temperature, reducing the need for power-hungry AC systems. Here’s a better look at what goes inside a Project Natick Pod. Also, by cutting down on electricity, Microsoft is hoping to make Natick data centers run off 100 percent renewable resources. And unlike brick-and-mortar data centers, which often require years of construction, Microsoft says it should be possible to build and deploy a Project Natick data center in just 90 days. Microsoft first tested this idea with Phase 1 of Project Natick in 2015, which saw the launch of a vessel that operated in the Pacific Ocean for four months from August to November. 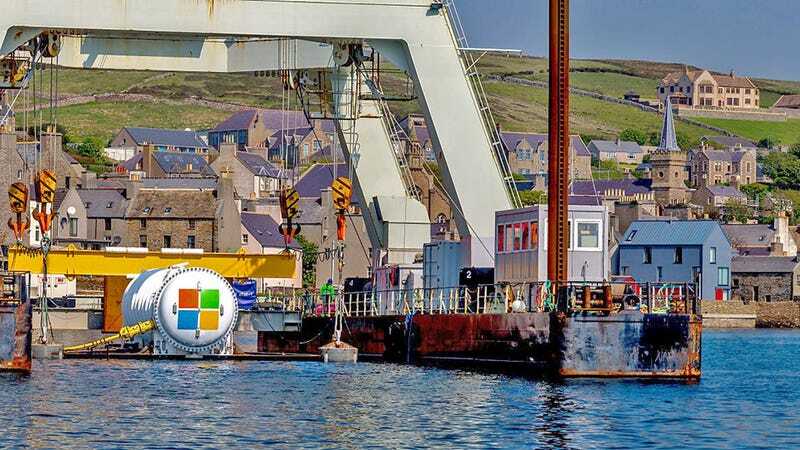 But this June marked the start of Phase 2, and with some help from the European Marine Energy Center, Microsoft’s second underwater data center was deployed in the Orkney Islands. And here’s a crab chilling with the Project Natick data center from Phase 1 in 2015. In keeping with Microsoft’s goal of leveraging renewable resources, the second unit is powered by electricity from wind and tide-powered generators located nearby. But in the future, Microsoft envisions that Project Natick data centers could create their own juice using generators located on the outside of the submersible unit. The only other resource Natick vessels need is an underwater cable connecting them to the internet. The big caveat to all this is that if something goes wrong, there won’t be anyone around to fix things, as Project Natick centers are designed to operate independently without direct human supervision for up to five years at a time, though Microsoft hopes to push that number closer to 20 in the future. At the end of the data center’s lifespan, Microsoft says each underwater server farm will be retrieved and recycled, once again to reduce waste and increase sustainability. While there are still some important questions that need to be answered, such as the potential impact of Project Natick on surrounding aquatic life due to increased water temperatures, Microsoft’s underwater data centers seem like an innovative approach to an otherwise boring, and wasteful business practice. And with the never-ending demand for cloud storage and computing, it might not be too long before our waters are filled with a bunch of these sunken computer tubes.